I mentioned in a previous post that the Columbia Gorge in Oregon is full of waterfalls – each one breathtaking. Literally. Breathtaking. Wahclella Falls is one of my favorites. It was a nice surprise when we happened upon it a few years ago. The hike up to the falls is lovely and not very strenuous. It makes for a relaxing afternoon as you meander along Tanner creek. We revisit this walk often, especially in the winter when Mt. Hood is covered in snow (The Gorge stays snow-free all winter). The walk is relaxing until you come up, kind of suddenly, on the falls. You can hear it from several feet away. You can’t miss the roar. But when you finally reach the noise you are hit with this incredible mix of sound, sight, & touch. The roar of the falls, the view as it crashes down into the pool, and the feel of the water splashing up on you as you witness all of this. The energy of it is palpable. 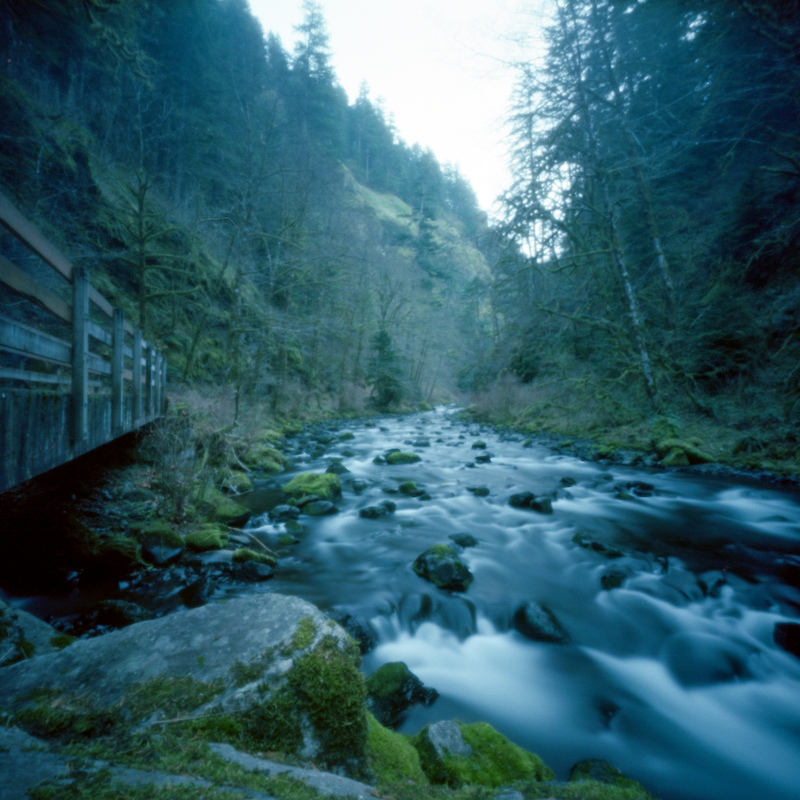 The pinhole photo above is interesting to me because it makes the scene look serene and quiet. 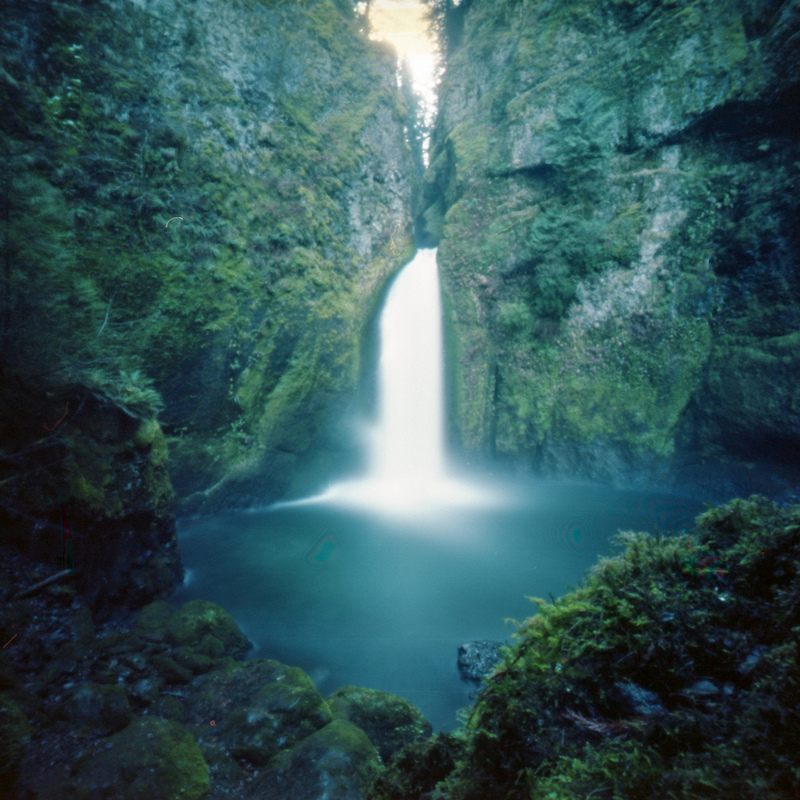 I find that interesting about pinhole photography in general. It takes a crowded train station and empties it of people. It takes a wild, reckless waterfall, and makes it serene. It creates something completely different from what you witnessed when you were making the photo. Very cool pinholes. We have a nice falls near where I live, but the best angle to shoot it is a little ponderous to get to (no real trail, rock, steep), and in high water, gets slippery. I haven’t been there in winter yet. Thank you! Yeah there are some waterfalls here too that are a bit treacherous to deal with in winter. This is so wonderfully beautiful, I am loving the deep rich greens contrasting with the hard white of the water. Thanks Brendan! I really wish I could capture the whole effect of being there on film but I think that’s impossible. All the more reason to keep going back. Sometimes it is nice just to visit a place and enjoy it for what it is. yes! It took me more than two minutes to make this photo – so I got to really sit and enjoy it. very meditative. it is! I noticed that your photo inside the church was 12 minutes. That’s a long time to sit and wait for an exposure. Lots of time to sit and just enjoy. or sit and be creeped out – whatever the case may be. It’s all zen, right? These are absolutely amazing, congrats!